The climate of Phuket is tropical, hot all year round, with a rainy season due to the southwest monsoon, which lasts from May to October, and a dry season from December to March. In April, before the monsoon, there is a certain increase in showers. In November, there can still be abundant rainfall, especially in the first part, either for any delay in the retreat of the monsoon, or because of a tropical cyclone (see below). However, there may be some showers also in the dry season, especially in December, when occasionally some of them can be particularly intense. 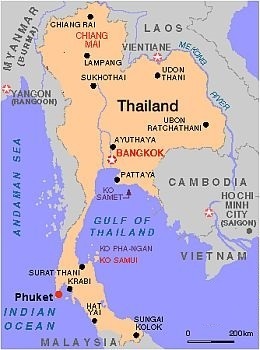 In an average year, about 2,200 millimeters (87 inches) of rain fall; on the coast on the Andaman Sea, where Phuket is located, the rains during the southwest monsoon are more abundant than on the other coast of peninsular Thailand, that of the Gulf of Siam, because the south-western winds hit it directly. However, the rainy period has two peaks, in the first part (May) and in the last (September-October). During some years, however, there may be torrential rains even in July and August. The temperature is high throughout the year, in fact average highs never drop below 30 °C (86 °F). However, from December to March, relative humidity is slightly lower. Whatever the season, particularly hot days are always possible, with peaks around 36/37 °C (97/99 °F), while nigths a bit cool, below 20 °C (68 °F), can sometimes occur from December to March. From February to April, before the arrival of the monsoon, there is a slight increase in temperature, in fact March and April are usually the hottest months of the year. The amount of sunshine in Phuket is good in the driest period, from late December to March, while during the rainy season the sun shines often enough, but it alternates with some cloudiness, which can sometimes lead to rain showers. Phuket is the largest Thai island and is a province together with the small islands that surround it; there are, in addition to the eponymous capital, towns like Patong, Karon, Rawai and Mai Khao. The most famous beaches are Patong Beach, Karon Beach, Kata Beach, Kata Noi Beach, Nai Han Beach, Kamala Beach, Surin Beach and Bang Tao Beach. Sometimes, Phuket like the rest of Thailand can be affected by tropical cyclones. 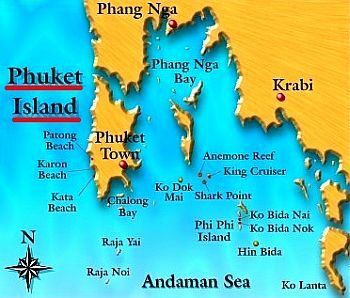 This area on the Andaman Sea is relatively protected, since cyclones can be formed nearby, but then they will head towards the Bay of Bengal, and this happens preferably between April and December, with two peaks at the beginning and at the end of the period (April-June and October-December), while typhoons can arrive from the east, but generally pass more to the north, from the South China Sea to mainland Thailand. However, from time to time they can also move to these latitudes, and this has happened in the last decades from mid-October to about 20 December. The sea in Phuket is warm enough to swim in all year round. It should be said that in summer the sea can be rough due to the monsoon, and there may be dangerous currents. Here is the average sea temperature. 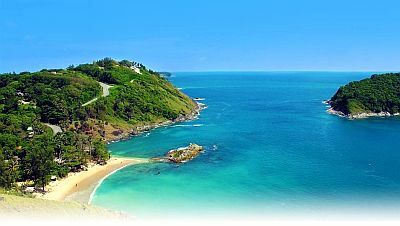 The best time to go to Phuket for a beach holiday is the dry season, from late December to March. However, surfers prefer the period from June to September, when waves are higher in the beaches exposed to the west, like Pansea Beach, Karon Beach and Kata Beach.